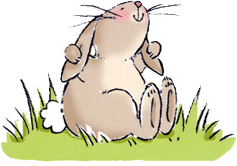 Lettice is a little rabbit who has appeared in ten picture books so far. 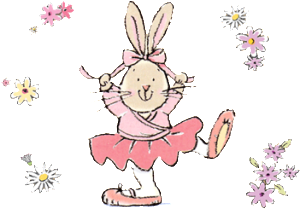 She is an independent, ambitious little rabbit and overcomes many setbacks to realise her dreams. She lives in a burrow deep in the country with her Mum, Dad and numerous brothers and sisters and in many ways she is just like any other wild rabbit but the difference is that from time to time, she has amazing adventures and becomes almost like a little human girl. She can talk and dance, laugh and fly…and do almost anything really. At the end of each adventure, Lettice cuddles up with her furry family, back in the safety and familiarity of the warm burrow. How did Lettice get her name? I first heard the name ‘Lettice’ when I was watching a television drama – The Flame Trees Of Thika – based on the book by Espeth Huxley. Lettice was a young woman that lived in Kenya a long time ago. I thought it was a very pretty name and also a bit funny because it sounded like a vegetable but spelled differently. 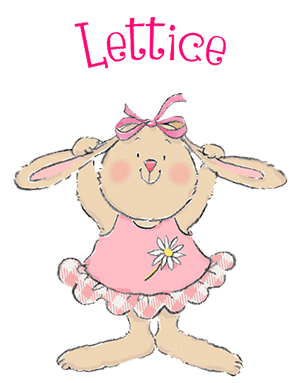 So when I was thinking about a name for my new rabbit character, ‘Lettice’ popped up. However, since having my own pet rabbits: Ruby, Moss, Roxy and Wellington – and all their babies, I have discovered that lettuce, (the salad vegetable) is not a particularly good thing for rabbits to eat because it gives them a tummy ache. When is Lettice Rabbit’s birthday? Lettice illustrations are drawn with a pencil crayon on water colour paper. The drawings are then scanned and coloured in on screen using Adobe photoshop software. Most often I start with the ears because they are quite expressive and help show the direction, movement and emotion in a scene. Our pet rabbits have been used as life models for reference and the view on the back cover of all the first edition Lettice picture books was inspired by Ruby rabbit washing her ears. What was the inspiration for the first Lettice story? The storyline for ‘Lettice The Dancing Rabbit’, was inspired by two things. Firstly, my own desire when I was young to be a ballerina and secondly, I’d noticed that the shape of a rabbit’s paw is so long and elegant – similar to a ballet shoe – so I thought that it would be fun to illustrate a rabbit wearing ballet shoes. I was also inspired by the idea that our pets or animals in general can enter and engage to some extent in a human world eg. Paddington Bear by Michael Bond. I wanted to explore this idea too. Lettice is available as a brand/licensed character and has been used for a babywear collection at Debenhams. A Style guide is available from the Licensing Department at Harper Collins Childrens Picture Books.